Fonroche Lighting has its own design office, where our lighting experts are ready to evaluate the feasibility of your project. The team works closely with the Group's R&D department to offer innovative solutions, based on the most advanced technologies. Our in-house teams will manage all aspects of your project development process and we'll assign a dedicated project manager to be responsible for meeting your specific functional needs and cost constraints. - We start by assessing your expectations and the specific lighting requirements of the site involved: location, photometric requirements, lighting schedules, etc. - The next step is to determine the site's solar potential, which involves calculating factors such as solar irradiance, temperatures and cloud cover to determine the exact amount of solar energy the location typically receives. - Then we calculate the energy needed to meet your lighting needs. 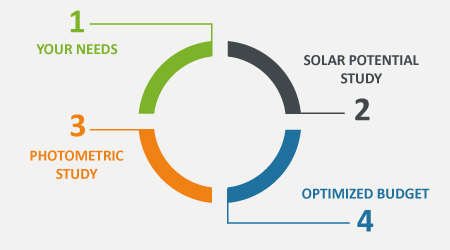 This involves determining the sizing of each component in the system – PV modules (solar panels), battery, solar charge controller, optics, light fixture, etc. – to match your project requirements. - We simulate the location of the streetlights to obtain the required lighting level and illuminance uniformity. The study also includes a simulation of how the light fixtures blend in with their surroundings. - Lastly, we put together an offer based on our calculations and recommended solutions and fully in line with your budget. Fonroche Lighting designs, manufactures and assembles its solar lighting solutions at its production facility in Roquefort, southwest France. Our teams provide full project management services, from design concept to solar and photometric surveys, manufacture, installation and maintenance. Fonroche Lighting's renewable energy experts are with you every step of the way to ensure your project's success. We have a dedicated team of 15 R&D experts who are working on developing the next generation of smart, high-performance solar lighting solutions. Our programme managers are all green energy specialists, on hand to advise and help you develop your ecologically sustainable projects. Fonroche Lighting has a network of specialized sales agents throughout France and worldwide, working locally with you to meet all your needs. Our in-house team of lighting experts perform solar and photometric surveys tailored to each project. 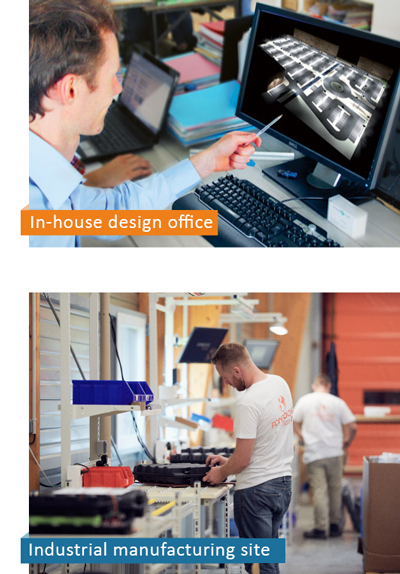 Our design office writes the technical specifications to ensure each system is right-sized. A dedicated project manager is assigned to each customer to ensure we meet your specific functional needs and cost constraints. Our state-of-the-art solar streetlight manufacturing facilities provide a swift response to customer requirements and deliver the guarantee of "Made in France" for all Fonroche Lighting solutions. Our logistics department handles all shipments, while our operations team oversees and assists with installation. We deploy a highly responsive after-sales team to provide fast services anywhere in the world.